Eco-Friendly Plastic Bits, a photo by timtak on Flickr. 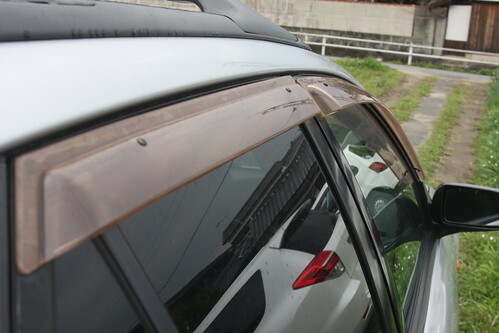 In perhaps an eco-friendly attempt to encourage car drivers to open their windows rather than use their air conditioners on hot but rainy days - such as exist in June especially - almost all Japanese cars are fitted with pieces of plastic along the tops of the windows to allow the windows to be opened while preventing rain, bugs and strong blasts of air from coming into the car. These bits of plastic, or window fairings, are another Japanese ecological, energy-saving innovation to compare with heated coffee tables (kotatsu), toilet cistern top hand basins, insulated kettles, and shared bath water.